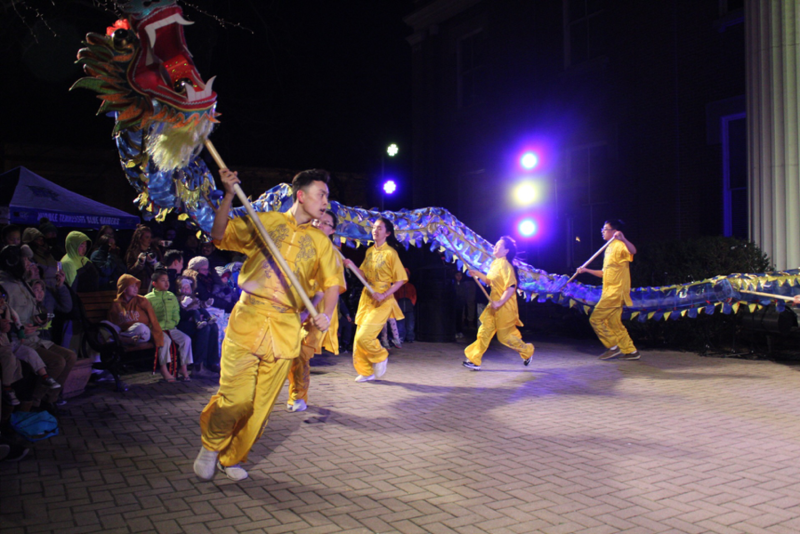 This year’s first Boro Art Crawl arrived with an added cultural flare. The Art Crawl was founded in 2015 by some local artists who wanted to showcase the artistic community in Murfreesboro. 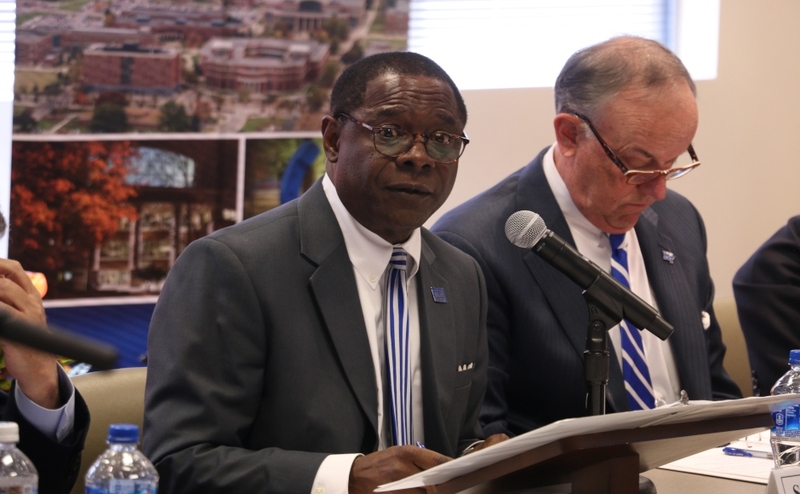 There are almost 15 participating locations as of now with locations both on and off the square. These shops have priced artwork hanging around their store, and some even have food and live entertainment. 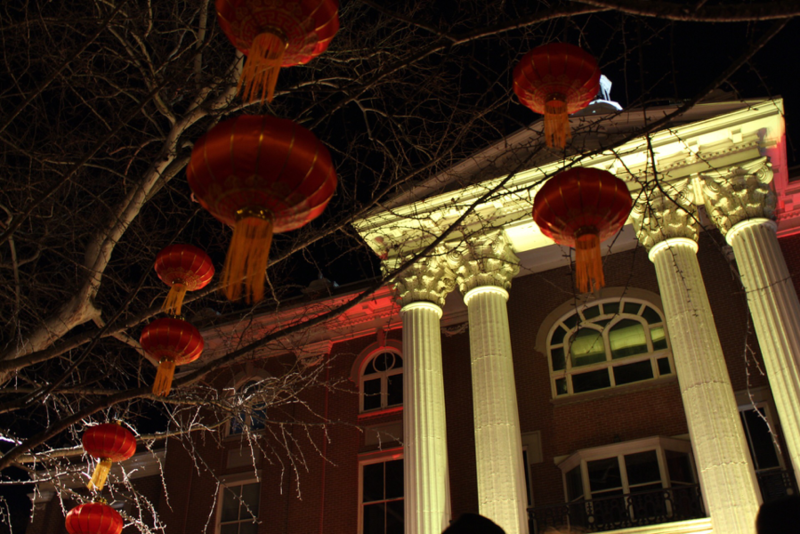 Currently, the Boro Art Crawl takes place every other month on the second Friday. 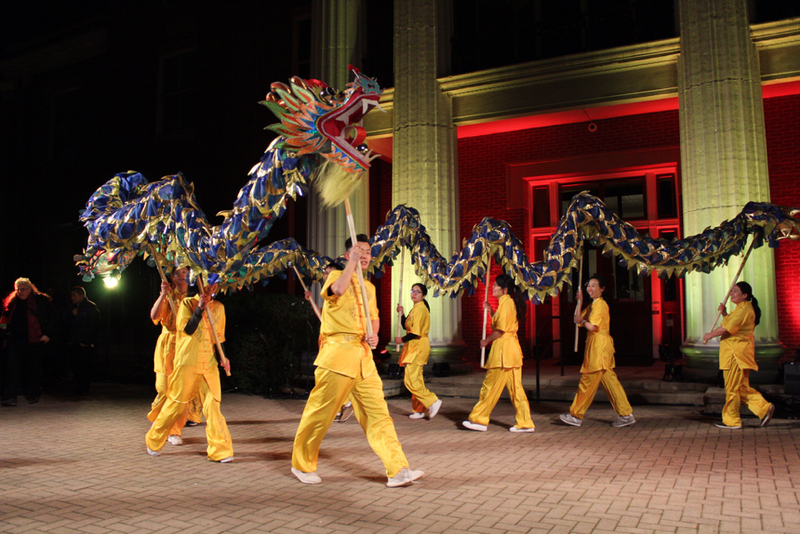 The Art Crawl kicked off with a dragon dance, organized by the Center for Chinese Music and Culture. 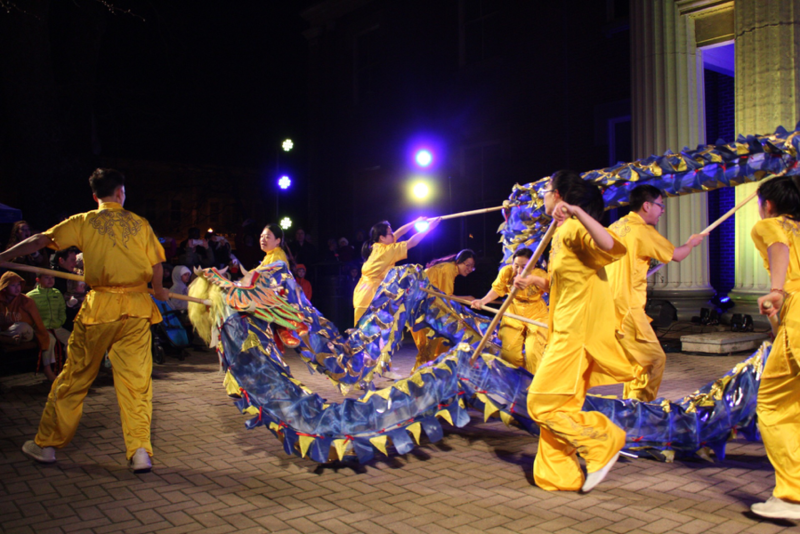 Dragon dances are often featured in Chinese New Year celebrations. 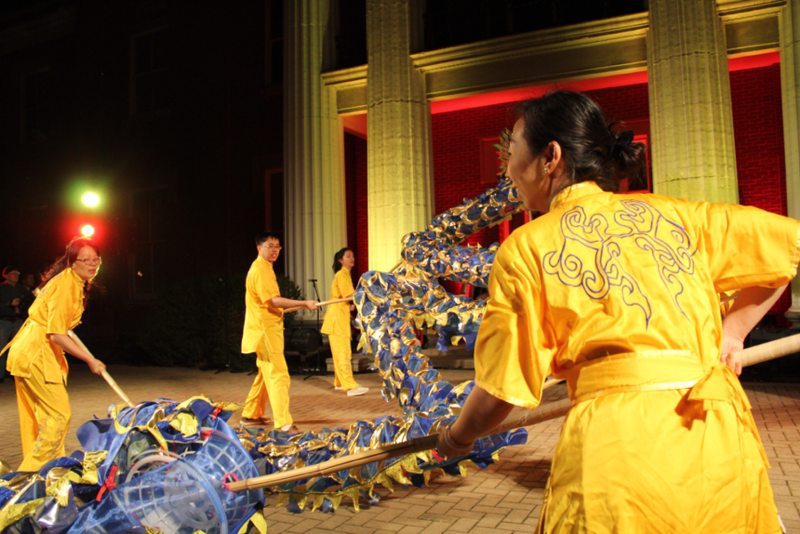 During the performance, experienced dancers use poles to manipulate a dragon, which is crafted from various materials. 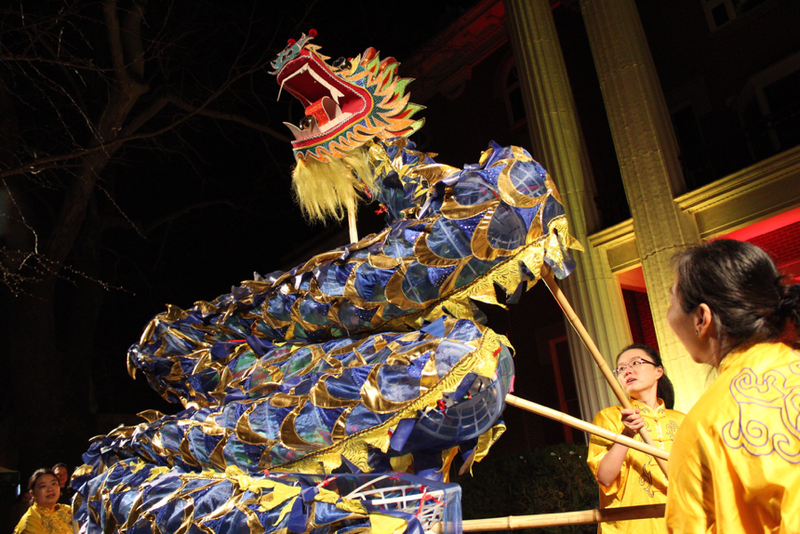 There were nine dancers dressed in gold, carrying the dragon and bringing it to life. The courthouse was lit up with green and red to celebrate the Lunar New Year, which contrasted perfectly with the gold outfits and vibrant colors on the dragon. 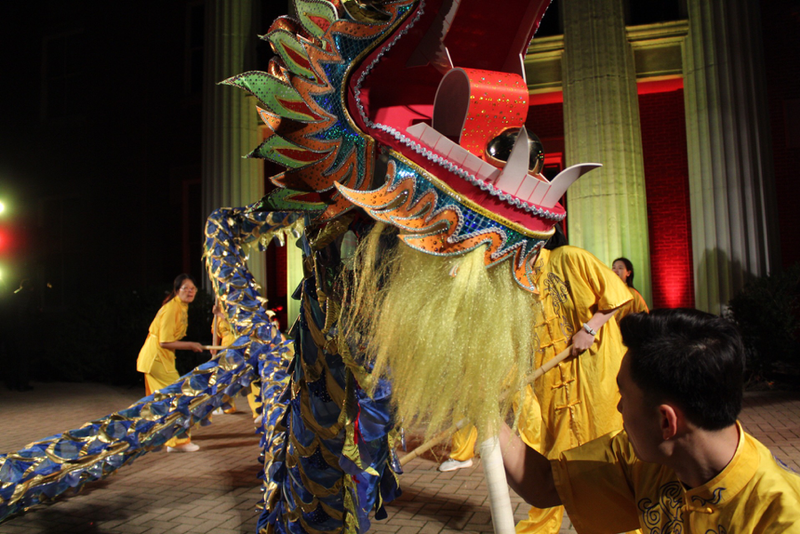 The dragon shuffled out from behind the scenes and was immediately the center of attention. 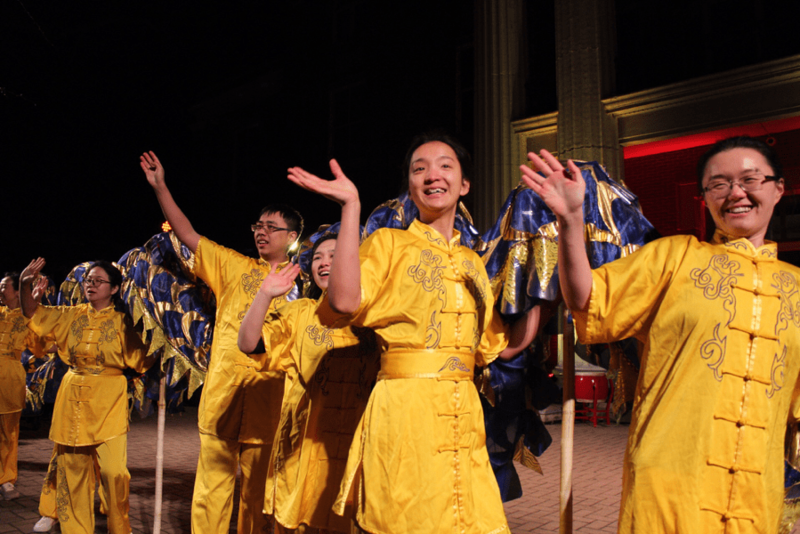 Shortly after the dragon dance, there were martial arts performances. 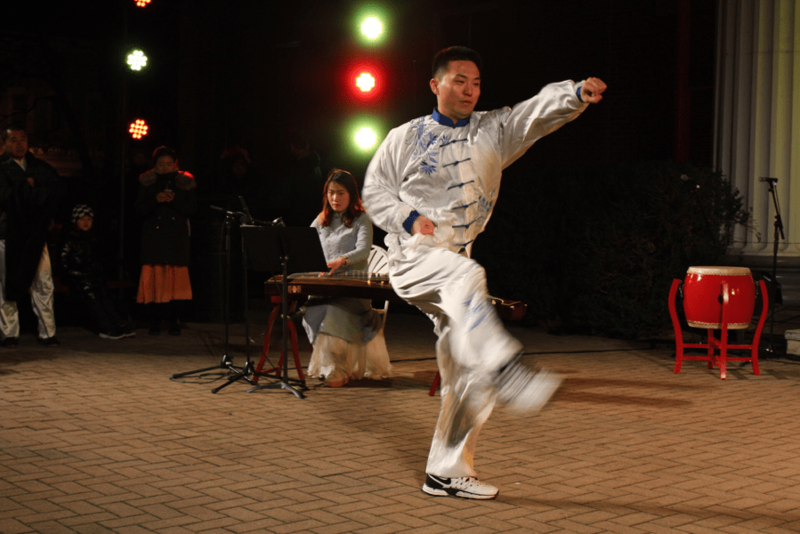 Both the Tai Chi and Tae Kwan Do performances were accompanied by a traditional Chinese string instrument called the guqin. 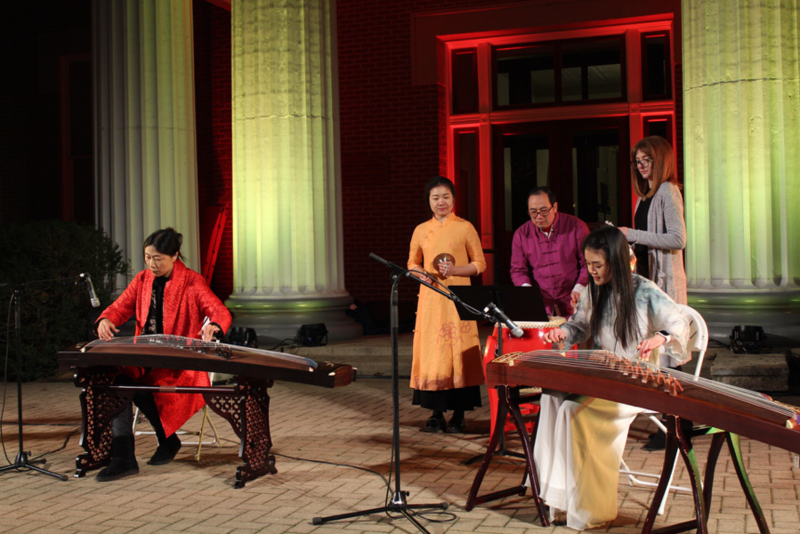 After these elegant but powerful performances, the musicians played a song together. 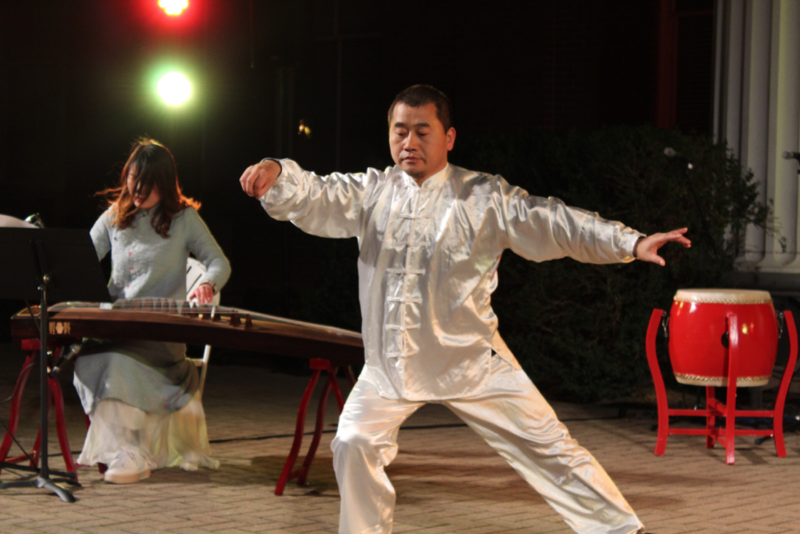 There were three guqins, along with several percussive instruments like drums and cymbals. 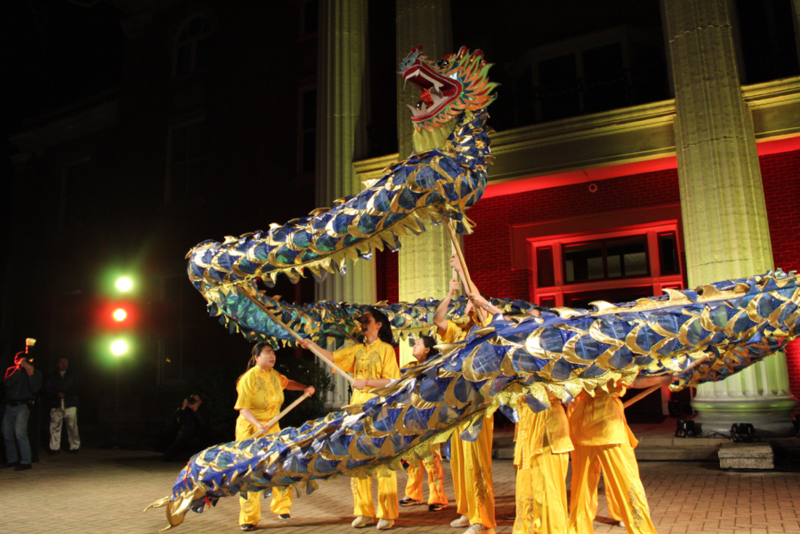 After this, the dragon came to life one last time and everyone began to make their way to the venues participating in the art crawl. 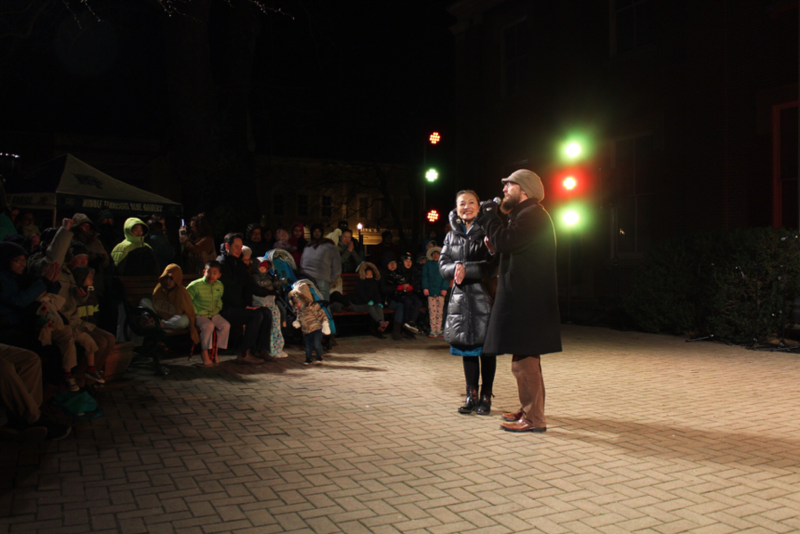 There were students of all ages from Woodbury, Bradley, Webb School, Segal Elementary, Pittard Elementary, Belmont and MTSU who came to see the spectacle and join the Art Crawl. Mayday Brewery held some “impromptu belly dance lessons” with food provided by Hernandez Mexican Deli, which is right off of the square. They had a large number of art pieces throughout the brewery, but most seemed to have a more modern pop-culture feel, with many recognizable faces and references on colorful canvases. Mayday also had a live performer by the name of Delyn Christian from Woodbury, Tennessee. 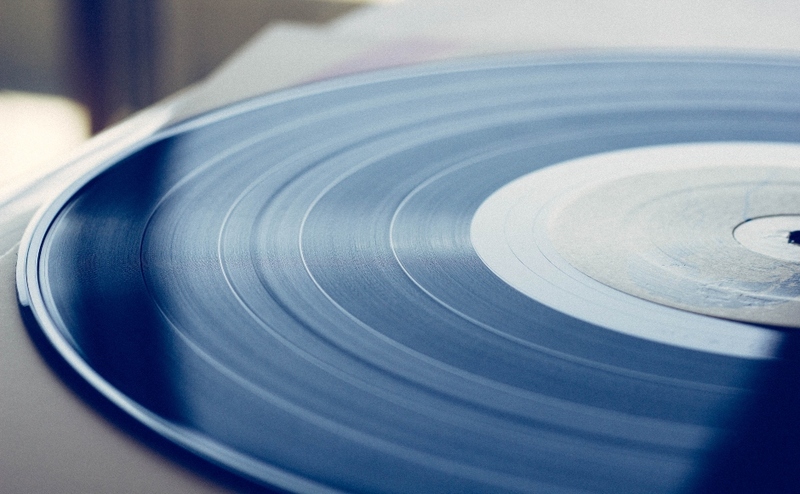 Christian, 77, is an experienced songwriter with a worn guitar that resonated through the room. His gruff yet smooth voice told many stories. People joined him in singing songs they knew and tapping their feet along to the music. Others admired and purchased the art that was displayed. 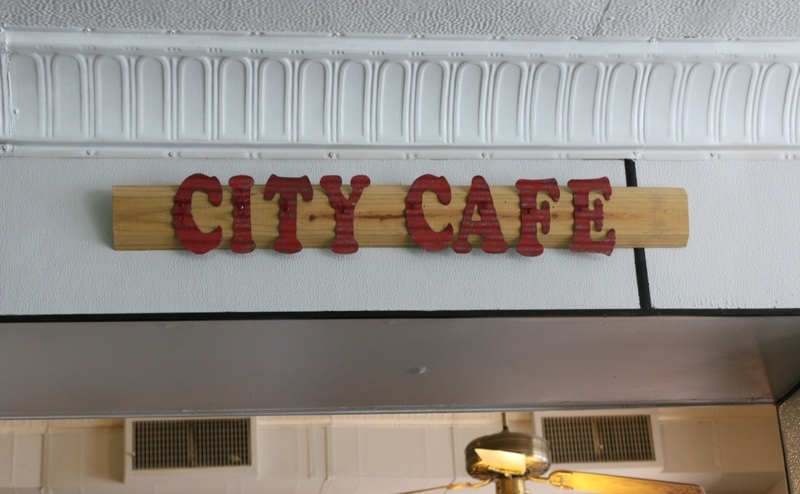 Boro Town Cakes is a little bakery on the square with several options for breakfast, lunch and dessert. Rachel Odom was one of the featured artists here, who had several different pieces. Ones that really stood out were the intricately detailed wood pieces she crafted. 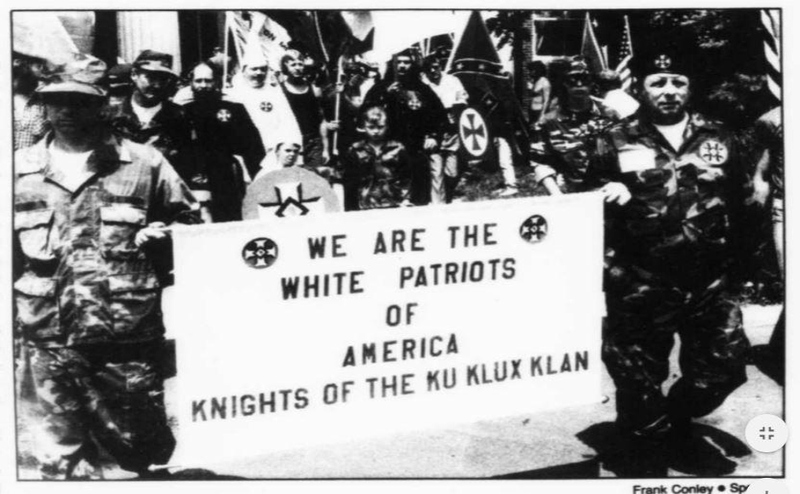 They featured objects such as flowers and animals. Next Home Realty also participated and had several rooms with different artwork. They provided wine with cheese and grapes to snack on while looking at the art. One of the featured artists here was Brette Leonardson. Leonardson just began a project of painting a state-specific image within the outline of the United States for all 50 states. She has completed four out of 50 so far, which can all be found on her Instagram page: Artbybrette. Liquid Smoke on the square was also a hot spot for the crawl. A lot of the artwork featured there seemed to be leaning towards surrealism, with very detailed and imaginative subjects. A list of all participating venues, artists and information on subsequent art crawls are available here and on their Facebook page.